The oval hanging grapevine pot rack is a French Provincial classic, not unfamiliar, but outside of original antiques, seldom well done. Careful craftsmanship and attention to authentic detail separates commercially available reproductions from a genuine example of the characteristic ideal. 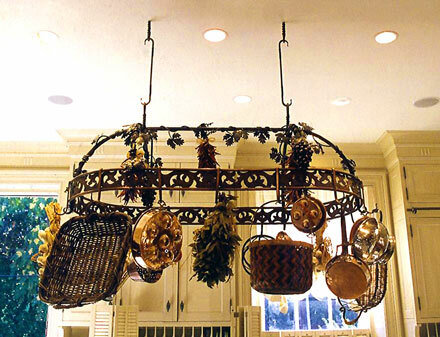 This particular pot rack was made to the order of Mary Drysdale and Drysdale Design Associates for the kitchen of the 1995 National Symphony Orchestra Showhouse on Bradley Lane in Chevy Chase, MD.